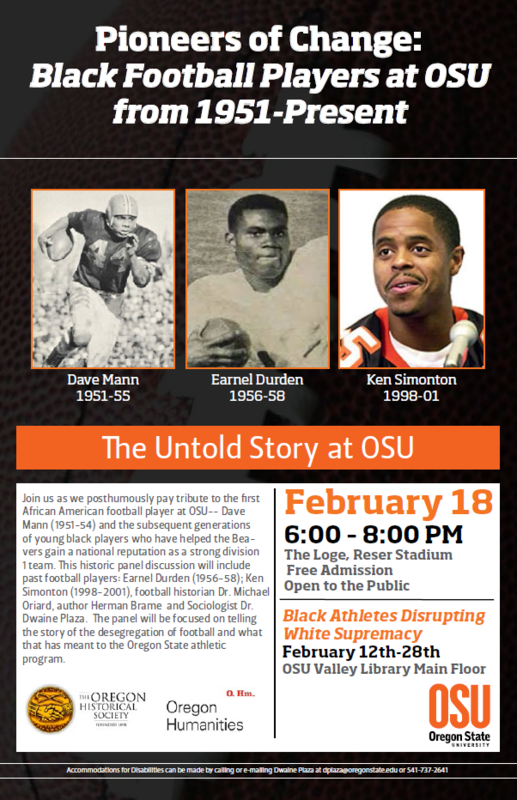 In honor of Black History Month 2014, the OMA collaborated with the Oregon Historical Society (OHS) and OSU Athletics to host an event regarding the desegregation of college football and specifically the story of the OSU football team! Check out the recording of the event that is available online! The event featured various speakers including: football historian Dr. Michael Oriard, author Herman Brame, OSU Sociology Professor Dr. Dwaine Plaza, and OSU student athlete Evan Bany, along with featured guests Earnel Durden, OSU football player 1956-1958 and Ken Simonton, OSU football player 1998-2001. The evening began with Dr. Oriard and Mr. Brame sharing the national and Oregonian history of collegiate football desegregation and Dr. Plaza and Bany telling the OSU story. Then Mr. Durden and Mr. Simonton shared their specific experiences of their time as student athletes here at OSU. Earnel Durden (b. circa 1937) attended OSU from 1955-1959 as a football player and a student studying physical education and science for a teaching degree. He played on the 1957 Rose Bowl team under Coach Tommy Prothro, and in his sophomore year, Durden was selected as “Joe College.” He was one of the few, first African American students to attend OSU—prior to OSU having their first African American female student. Due to this, Durden had many experiences dealing with cultural differences in Corvallis regarding a lack of knowledge and interaction with African American people. In the interview Durden discusses his high school years in Los Angeles as an African American and rising football player; recruitment and experiences as a student, African American, and athlete at Oregon State University; his relationship with Tommy Prothro as a player and assistant coach; his various coaching experiences at Compton Junior College, Long Beach State University, UCLA, and for the Rams; and a brief description of his children’s sports careers. 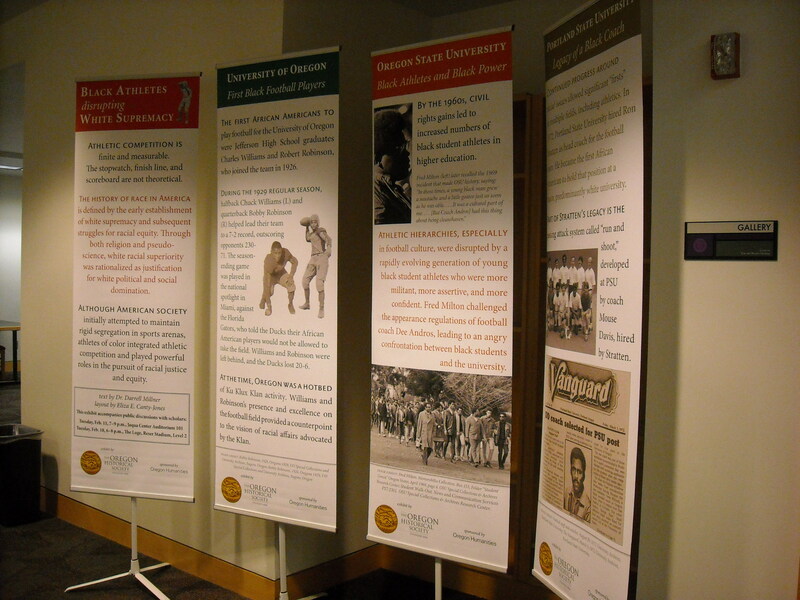 Also, as a special component to the event, OHS collaborated with Dr. Darrell Miller to curate a traveling exhibit to showcase the histories of the U of O, PSU, and OSU football teams in an exhibit titled “Black Power Disrupting White Supremacy” and hosted by the OSU Valley Library.